There are moments in your baby’s life that might seem small to most people, but to a parent, they are enormous. 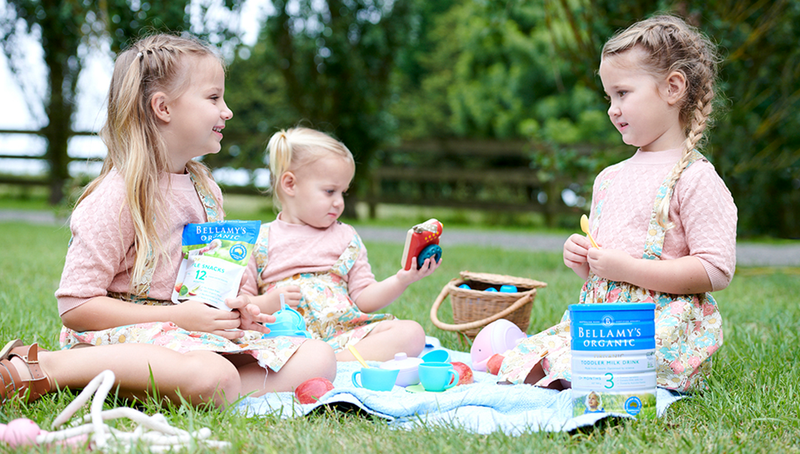 At Bellamy’s Organic, we call these the ‘big little milestone moments’ and guess what? These big little milestone moments absolutely count! The first six weeks of your baby’s life is typically very floppy, with newborns not having enough strength and control in their neck muscles to hold their head up. Head control is limited, but as you support your baby you’ll start to see them lift their head to gaze adoringly into your eyes. A few more weeks and they might be turning their head from side to side in response to sound. By four - five months they’re a master of head control and you can celebrate knowing you’ve got the crook of your arm and supportive hands back. Your baby might have been smiling in utero and may have been showering you in smiles since arriving, but these first smiles aren’t intentional or a response to anything. Similar to the jerky arm and leg movements your baby’s body experiences as it goes through the equipment testing process, his early smiles are nothing more than reflexes. It’s not until around the age of 12 weeks when smiles become a form of response. Trust us, you’ll know a real smile when you see it and you’ll definitely want to celebrate it. Smiling is a large part of your child’s development, find out more here. It’s an exciting day when your baby reaches out for something they want. It means the eyes are starting to work together on depth perception and that their binocular vision development is on track. Time to put away the breakables! As your baby explores this new found ability, expect them to grab hold of anything and everything. Encourage this too by supplying them with lots of interesting things in arms reach. Tummy time is one of those things you know you should do for your baby’s development, but it can be hard to watch at first. Some babies really don’t respond well to tummy time and will choose to just lay there and cry. Keep persevering and your baby will one day push themself up, lean towards one side and roll over. From that moment, everything changes. Suddenly tummy time is the most fun you and your baby can have together. How much tummy-time should your baby have? Find out here. Learning to stand opens up another new world for your baby to explore and the moment they first weight bear, you’ll see the excitement in both their face and yours. Your baby’s got a new skill and are on their way to independence! Weight bearing generally comes at around three months old, but you’ll notice the knees sag a little (a bit like standing as a drunk person). Before long this will strengthen and then you’ve got a baby who can balance. Next stop...standing! Your baby has likely been responding to your voice and turning towards you when you enter the room for some time, but there will be a day when someone randomly says their name and your baby will turn, smile and respond. They hear you and they know what’s going on! Use their name frequently and the earlier this day will come. The moment your baby holds themself in the sitting position for more than 30 seconds is a big one. Eventually they’ll topple (most likely out of boredom), but they’re doing it - your baby’s sitting! Celebrate loudly and they’ll be wanting to try again and again. Babies generally learn to sit independently between four and seven months old. Little big milestones don’t get much bigger than baby’s first word - especially if that word is “mama” or “dada”. You’ve been listening to vocalising and verbal experimentation for weeks, and then here it is - an actual word! Said with meaning, it’s truly something to celebrate. Expect to hear this word sometime between 9 and 14 months. Most babies learn to crawl between the age of four and seven months, although some babies prefer other modes of transport such as bottom shuffling, stomach slithering or rolling. Whatever your baby’s chosen style, they’re getting mobile and it’s time to celebrate! As long as your baby is using their arms and legs equally on both sides of their body and learning how to coordinate them, you’ve got nothing to worry about. Mobility counts, in any form. Following a time of assisted weight bearing, your baby might start to pull themself up on things in an attempt to stand completely upright. One day they’ll get it, and won’t you be excited!!! Seeing your baby stand their self up for the first time is amazing, but watch out - a bump is coming. Don’t make a big deal out of it - there are plenty of bumps on the way. Stay excited and grow your baby’s confidence and eventually the bumps will go away. Do you ever play the game, “where’s my nose”? If not, it’s time to start playing it! Get excited and celebrate as your baby discovers where your body parts are. Keep asking questions and one day they’ll reach out and touch your nose. You can do it the other way round too and get your little one to touch their own nose. Between 8 and 12 months you’ll see your baby reaching for food and eating finger foods. Babies love experimenting and having fun with tastes and textures. As your baby’s pincer grip gets stronger, you can expect them to one day reach for the spoon. If only they could talk, your little one would tell you “I can do it”. Even babies get proud, and seeing their little face as they attempt to spoon feed themself is priceless. Read more about development milestones in your child’s first year here. Teaching your child to drink from a cup takes patience, but sooner or later they’ll get it. If you’re yet to wean your baby from the breast or bottle, being able to hold their own cup will show your child that there’s an alternate route to liquid refreshment. This will make weaning easier and helps your toddler to gain mastery over their mouth muscles. It might not seem like a big little milestone, but this one’s really important! We don’t need to tell you that the first steps are something worth celebrating. One of the most exciting milestones, your baby’s first steps are a symbol of the next chapter to come. If you feel them coming, try to capture them on video so you can repeat the moment again and again. This will also be good for gauging how your baby’s confidence is growing. Before long they’ll be steady on their feet and running everywhere they can. The next thing to celebrate is your baby’s first jump off a low wall or step. This means that their motor skills are right where they need to be and that your baby’s well and truly hit the toddler stage. Jumping is so much fun for kids and is important for balance and self esteem, so encourage it when you can. Shape sorter toys are classic toddler favourites, and with good reason...they’re a fun challenge. By figuring out how to drop each piece into its proper hole, your baby is learning to categorise and name shapes. Between 15 and 18 months, your baby will have better hand-eye coordination and problem solving skills to successfully shape sort their favourite game. No more random guesses! Read more about developmental milestones for toddlers aged 12-24 month here. Your baby might not be able to put two words or a sentence together yet, but if he can hold a conversation with you, that’s pretty cool! Showing interest in what you’re saying is cause for celebration and when they respond to your questions or help to relay a story, it’s a magic day! It might not seem like something worth celebrating, and it might come as a shock, but your baby’s first tantrum is a sign that your child’s ‘normal’. Baby tantrums occur because of their inability to express themselves and a sudden loss of emotional control. Instead of panic, celebrate this next stage and start to think of ways in which to limit tantrums (or at least calm them). Your baby might have been socialising with other babies from the very early days, but there’s something different about their first ‘official’ play date. More than just ‘hanging out with mum’s friend’s babies’, a play date is a chance to hang out with their pal. If things go well, they can be fun for everyone involved. As your toddler’s gross motor skills and hand-eye coordination develops, they’ll start to understand that their supposed to respond when a ball is coming near. One day your child will put their hands together, cup them, and then catch it! Their big grin at a successful catch and hug will say it all. The first few years are filled with big little moments, and not just for your little one. Mummy and daddy have some big little moments to celebrate too, so don’t forget to pay attention to the times when you should be patting your own back: your first solo outing, first time you know what a cry means, first good night’s sleep, first date night, first time you drink a coffee that’s still hot, first time you leave your baby with a sitter who’s not a family member, first day back in your skinny jeans, first time you manage a whole day without talking about your baby’s bowel movements, first spontaneous “I love you”. Yep, there’s a lot to be happy about. Embrace every big little milestone!